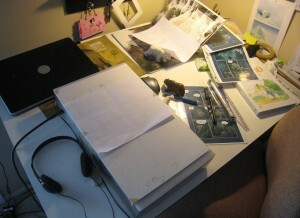 This is my artist desk as it currently is, nothing moved or cleaned up. The piece of paper taped over top of my comic page is my technique to battle doubting-artist tendencies to continuously go back and tweak/redraw finished panels. Keeping them out of sight lets me focus on moving forward. What’s nice is when I finish the page, I peel off the piece of paper and get to see all the panels together on the page. As you can see, the page rests on a light table – I work over top of storyboards blown up to 11″x 17″, and draw each panel in order until the page is finished. Then I lay another sheet over top of that and draw the word balloons and sound effects. Laptop – for reference, my character designs, and music. Bear figurines – I picked the polar bear adult and cub up at Target in the kid’s toy section. They’re made by Schleich, a company that produces very detailed animal figurines. I find them to be a good three-dimensional reality check for tough angles. The brown bear is a Pocahontas toy, so he’s more stylized than the other two, but still nice. Printouts of finished comic pages for character reference and consistency. Rulers, pencils, and erasers – Mechanical pencil, 0.5mm pentel for drawing. Staedtler Mars plastic eraser for general erasing. Magic rub for large mistakes. Tuff Stuff Eraser Stick for erasing small details (you can find the Tuff Stuff Eraser Stick s at your local art supply store, or on Amazon here). Totoro Art Book – A breathtaking collection of Hayao Miyazaki Totoro art and production notes. Very inspiring, it serves as a reminder of where I want to be with my artwork. You can find the book on Amazon here.